If you are thinking of going vegan then this article is for you. A vegan diet can be healthy as long as individuals ensure that they are meeting all their micronutrients and macronutrient needs like iron, omega-3 fatty acids, calcium, vitamin B12 and vitamin D.
In this blog post, you will discover the best ways for vegans to acquire healthy proteins. There is no one right way to eat for everyone. We are all different and what works for one person may not work for the next. If Cutting out eggs, meat and dairy leave you confused on how to eat a balanced diet then you are in the right place! There’s an amazing assortment of options out there for anyone looking to maintaining a pure vegan lifestyle. However, with more and more people choosing to follow a vegan lifestyle I hope this plant-based eating blog post will be of interest. The extent to which plant-based sources can provide excellent sources of nutrition is endless. With a balanced vegan diet, you can help yourself become the healthiest version of yourself. For those starting Veganuary this month, these minimally processed substitute animal products can be seen as ideal replacements. versatile protein-rich alternatives to meat, fish, poultry and eggs. Beans, lentils and peas are excellent sources of many nutrients. Most nuts are good sources of iron, fibre, magnesium, zinc, selenium and vitamin E with almonds, walnuts and pistachios the most nutritious varieties. Hemp, chia and flaxseeds are also sources of protein and omega-3 fatty acids Alpha linoleic Acid (ALA). That Protein I Heart Pumpkin and Chia Seeds Super Protein is a great source of ALA. In order to achieve your recommended daily allowance of calcium, opt for fortified varieties with vitamins B12 and D.
Spirulina chlorella are sources of complete protein that aren’t animal-based, they have added bonus of containing Docosahexaenoic Acid (DHA), the most active Omega-3 fatty acid. Spelt, amaranth, brown rice protein and quinoa (technically a seed) are all great sources of complex carbs, fibre, iron, B-vitamins and are especially high in protein. Tempeh, miso, sauerkraut and kimchi all contain probiotics and vitamin K2. Leafy greens such as spinach, kale and bok choy are both particularly high in iron, calcium and other key nutrients. Plant-based diets have an array of health benefits including a 15% lower risk of developing or dying from cancer, reducing symptoms of arthritis and reduced risk of developing Alzheimer’s disease. Those that follow a plant-based diet also tend to be slimmer than those who don’t, with studies demonstrating vegans have a lower body mass index (BMI) than non-vegans. This lower BMI trend may be caused by a higher dietary fibre with a vegan diet intake which can make you feel fuller. For such health benefits to come to fruition, a well-planned diet that limits processed foods and embraces organic and nutrient-rich ones is crucial. Those who follow poorly planned plant-based diets – just as with badly planned omnivore diets – are at risk of certain nutrient deficiencies. These include a significantly higher risk of having inadequate levels of vitamin B12, vitamin D, omega-3s, iodine, iron, calcium and zinc. These nutritional requirements are particularly important for children and pregnant women as development can be hindered through nutritional deficiencies. There are however particular elements that every plant-based diet should be aware of. Click Here To View The Products Ingredients! A common concern amongst plant-based diets is a lack of sufficient protein. Higher protein diets promote muscle strength and satiety. Protein is, of course, vital for muscle and bone health but also for our cellular structure, even affecting our skin and hair. With about 20% of the human body made up of protein and as our bodies don’t store protein, it’s important to get an adequate amount from your diet every single day. Thankfully, there are plenty of delicious, protein-rich plant-based foods to consider including tofu, lentils, quinoa, hemp, chia and beans. 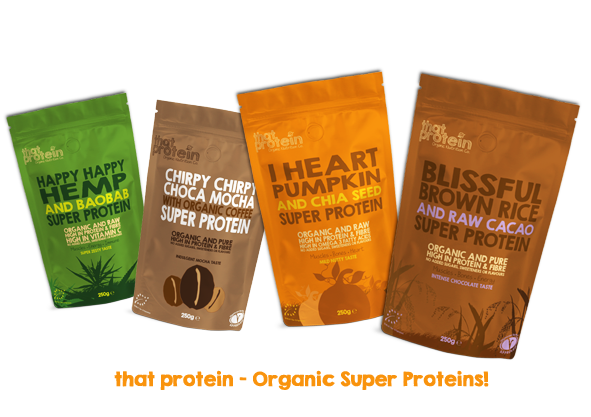 That Protein is a plant-based range of organic super proteins that are all organic and cold pressed and an excellent and easy way to add protein and nutrition to your vegan diet. You can add to all your fav recipes or make protein shakes. It is also important to vary your sources of protein throughout the day, as each provides different amino acids, vitamins and minerals that are all uniquely important for your health. Vitamin B12 is a water-soluble vitamin that is involved in the function of every cell in the body. It is particularly important in the formation of blood and the function of the brain. As B12 is critical for life is by far the most important nutrient that plant-based eaters must be concerned with. Palmyra Nectar is an excellent way to get B12 and a range of B vitamins into a vegan diet as this sweet superfood is extremely high in all the B Vits. Nutritional Yeast like Marmite will also add B12. The type of Vitamin D we get from the sun isn’t always enough, especially in colder countries such as the UK. This issue is so apparent that it is now widely recommended that everyone supplements with vitamin D in winter months. With studies suggesting vegans are up to 74% more likely to be deficient than meat eaters, fortified milk alternatives should be consumed. Omega-3 containing foods, especially those high in alpha-linolenic acid (ALA), can help the body produce longer-chain omega-3s such as eicosapentaenoic acid (EPA) and docosahexaenoic acid (DHA). Foods rich in Omega-3 include hemp, flaxseeds, walnuts and soybeans. A daily intake of 200–300mg of EPA and DHA from an algae oil supplement is an alternative preventive measure against Omega-3 deficiency. Despite a plentiful dark leafy green diet, without vitamin C very little iron is absorbed and any benefits won’t be obtained. Additionally, the type of iron in plant-based sources contain non-haem iron which is very difficult to be absorbed effectively. With too much iron causing serious health complications, iron supplementation should only be considered where there is documented deficiency. If these potential deficiencies are enough to consider a completely plant-based diet one step too far, meat-free Mondays are a great way to dip your toe in the water. Breakfast: Porridge with That Protein I Heart Pumpkin and Chia Seed Raw Vegan Super protein is a great start. With almond milk and topped with almond nut butter and a handful of raspberries. Lunch: Quinoa falafel on a bed of spinach, peppers and pomegranate topped with flaxseed and seeds. Snack: Brown rice cakes with hummus. Dinner: An Asian stir fry with tons of vegetables and bok choy, complete with some baked tofu. Dessert: Fortified coconut yogurt with blueberries topped with crushed nuts That Protein’s Blissful Brown Rice and Raw Cacao Super Protein and some cacao nibs. If you loved the post feel free to share it with your friends on social media by clicking the share icons below! See Also: What If Everything You New About Sports Fitness Is Wrong? – Read To Find Out. See Also: The Number 1 Thing They Don’t Tell You Before You Start Your Weight Loss Journey. See Also: How I Transformed From An Ideal Body To An Attractive Reshaped Body.